Beginner steroid cycles can be some of the most difficult cycles to understand; not because they’re complicated but because the individual more than likely has very little understanding of the hormones. So often so many beginner steroid cycles fall short of their full potential simply because the individual doesn’t know what they’re doing. Often the individual gets anxious and randomly chooses a particular steroid that is fairly useless on its own. Another common problem is dosing and duration; often the individual doesn’t understand how long he should run the product or how much he should take and by the time his use is through what’s staring back in the mirror isn’t any different than what stared back a few weeks ago. This can be very frustrating for the newbie as he is most commonly referred and more often than not many newbies turn to steroid message boards. Steroid message boards can be great places to share information and to find varying opinions but that can also be a problem; when you find so many varying opinions it’s hard to know which ones are worth your time. We have provided you with some answers here today that will hopefully help you avoid so many beginner steroid cycle mistakes. Before we begin there are some things you need to understand; performance enhancing is illegal in the United States and before you begin any cycle you need to understand the law as it stands regarding where you live. Further, you are highly encouraged to educate yourself on the many various anabolic steroidal hormones of which there are many and if you do these things most will find whichever beginner steroid cycles they choose they will enjoy a positive experience. For most newbies a simple testosterone cycle will always prove to be best and while it may be simple it is guaranteed to be highly effective. Testosterone is the most versatile anabolic steroid of all and generally one of the well-tolerated among healthy adult males. While it will be effective there is another reason we can label these beginner steroid cycles as the best option and that is because you’re only using testosterone. While you can start off by stacking different steroids together many will find a cycle of just testosterone to be more efficient in the long run and the reasons are simple. If you’ve never supplemented with anabolic steroids you don’t know how you’re going to react and if you’re stacking multiple steroids and run into problems it’s going to be impossible to pinpoint which steroid is causing the problem. Further, if you can tolerate testosterone well and most can this will generally be a good sign that many other steroids will be tolerated well by you as well. 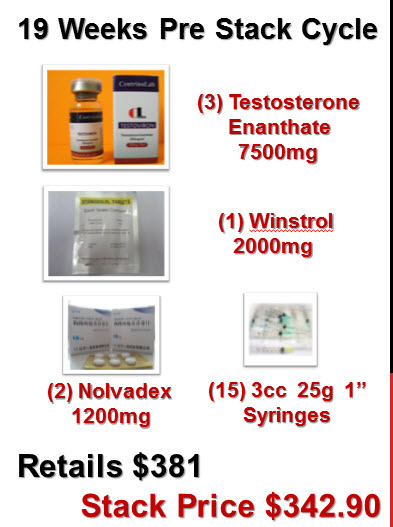 For these standard beginner steroid cycles in most cases Testosterone-Enanthate and Testosterone-Cypionate will be our primary choices; simply pick one or the other. Most all men will find 250mg per week of either form to give them a pretty good boost with 500mg per week being far more performance noteworthy. Keep in mind these are large ester testosterones and the effects will not be very noticeable for a few weeks in most cases and to truly gain any advantage use must far extend past a mere few weeks. In most cases a good 12 week course is a good place to start followed of course by Post Cycle Therapy (PCT.) For the beginner steroid cycles PCT will merely consist of the Selective Estrogen Receptor Modulator (SERM) Tamoxifen Citrate (Nolvadex) for a course of 3-4 weeks.